CSI: Color, Stories, Inspiration es un sitio de desafíos de scrapbooking que comenzó a principios de 2012 y que ya se ha ubicado como una de las principales competencias entre los más fanáticos scrappers del mundo. CSI: Color, Stories, Inspiration is a scrapbooking challenge website that started early in 2012 and that has already become one of the main challenges among scrapbooking world´s biggest fans. Se trata de una imagen de inspiración (la escena del crimen) de la cual se obtiene una serie de evidencias y testimonios que cada “sospechoso” debe utilizar junto con una paleta de colores afines a la imagen para resolver el caso (mediante la creación de una página o layout). It starts with an inspiration image, “the crime scene”, from which they obtain a series of “evidences” and “testimonies” that each “suspect (participant) must use along with a color palette taken from the image itself to “solve the case” by the creation of a L.O. Todos los participantes pasan a ser “sospechosos” que los detectives (o miembros del equipo de diseño de CSI) deben investigar para determinar quienes integrarán el listado de “UNDER SURVEILLANCE” (BAJO SOSPECHA) de la semana. 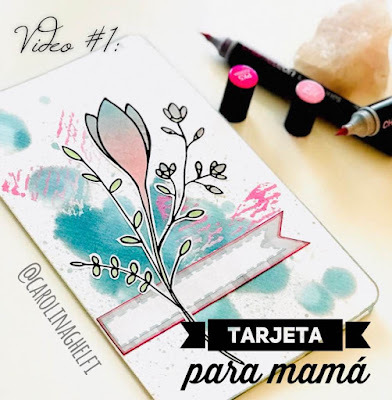 Este listado se compone por un trabajo principal que, por la forma en contar su historia (elemento clave de este desafío y de la verdadera escencia del scrapbooking en general) se hace meritorio de la distinción “STAR WITNESS” (TESTIGO ESTELAR) de esa semana. All participants became “suspects” that the CSI “detectives” (CSI design team members) must investigate to determine who will enter the “UNDER SURVEILLANCE” list of each week. This list is made up by one STAR WITNESS who earns this distinction for his/her way to tell the story, which is a key element of this challenge and of the real essence of scrapbooking itself. Al STAR WITNESS le siguen los primeros 5 trabajos que ganan la distinción de “MOST WANTED” (LOS MÁS BUSCADOS), seguido por otros 5 trabajos que se destacan y entran “ON THE WATCH LIST” (EN LA MIRA). Apart from this STAR WITNESS there are 10 pieces of work chosen, the first 5 are awarded the MOST WANTED distinction and the second 5 become listed ON THE WATCH LIST. Yo tuve el honor en 4 ocasiones de mis esporádicas participaciones (cómo quisiera poder participar ABSOLUTAMENTE TODAS LAS SEMANAS!) de pertenecer a estas listas privilegiadas con trabajos que incluso yo no consideraba podían tener tal chance… y sin embargo, fueron elegidos! I´ve had the honor of being listed in such privileged lists on 4 different occasions from my sporadic participations (how I wish I can participate ABSOLUTELY EVERY WEEK!). Some of those awards were given to pieces of work I thought had no chance… and yet, were chosen! Las intensas rosas rojas de Carolina nos llamaron la atención y cuando vimos cómo las hizo nos impresionamos mucho por su creatividad! Nos gustaron sus dulces fotos y cómo distribuyó el texto por toda la página, y en particular nos encantó la forma en que sus fotos se abren como librito para revelar su extenso y significativo relato… y qué adorable detalle el de agregar pompones como manijitas para abrir esas ventanitas! La página de Carolina es simplemente adorable! Carolina's bold red roses caught our eye, and when we saw how she made them, we were very impressed by her creativity! We love her sweet snapshots and how she's scattered text around the page, and we especially love how her photos flip open to reveal extensive and meaningful journaling, and how cute is it that she used green pom-poms as handles to open the flaps! Carolina's layout is simply delightful! Estos fueron algunos de los comentarios que talentosísimas scrappers dejaron sobre mi trabajo. L@s invito a visitar sus perfiles en CSI (sigan los links de sus nombres) y visiten sus blogs para ver las cosas maravillosas que hacen… Gracias a todas por sus comentarios!! These were comments I got from very talented scrappers on my work. 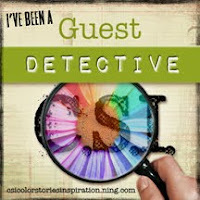 I invite you to follow the links to their CSI profiles and from there to their blogs so you can get to know their amazing work… Thank you all for your comments!! Awesome layout!! Love the background, your scattered journaling, and those cute, cute photos!! WOW.....it seems to being away from your scrapspace was a GOOD thing.... This Page is AMAZING!!.. Love.. Love.. Love the misting... the masking .... the freedom of your journaling.. the doodling.... those flowers and those GREAT photos..Love how they hold some journaling, too.. How creative!! What a fabulous layout, love the misting and the journalling coming out form the photos. so very vibrant as well. Carolina!!!!! This is wonderful! I love your flower and the flip photo's are ingenious. The little poms you attached are so 70's! Thank you so much for sharing this with us! It's fabulous! La página de Carolina simplemente “grita” diversión y risas! Ella hizo un estupendo trabajo utilizando los CSI Coordinates [papeles y elementos imprimibles del caso] y creemos que los garabatos sobre la foto agregan sentido a la idea de JUEGO y DIVERSIÓN, tema principal de su trabajo. La rueda giratoria que revela el realato detallado y divertido sobre el cumpleaños de su hija es el elemento más brillante y creativo de su página! Todas deseamos que se nos haya ocurrido a nosotras! Carolina's page just scream fun and giggles! She did a terrific job using the CSI Coordinates, and we think the doodling on the photo adds to the sense of play and fun that her layout is all about. The turning wheel that reveals the joyful and detailed story of her daughter's birthday is a brilliant and creative addition to Carolina's page! We all wish we had thought of that! I just love this page Carolina, the doodling and outling are so cool! It really stands out in the gallery. Fantastic details everywhere you look, gorgeous! Love how you used so many different papers! such a fun layout! That sounds like fantatic day! Love the doodling on the photo! And the spinning journaling is great. Wonderful details and design. TFS! Oh, how delightful and fun and happy is this, Carolina! Love how you've used the CSI Coordinates, and that journaling wheel is so incredibly clever! Loooooooooove your layout. All the details, the wheel is a fantastic idea. I also like how you highlighted the picture of your daughter in the bicycle. The journaling is very touching too!!! Me encanta!! TESTIGO ESTRELLA!! QUÉ HONOR!! 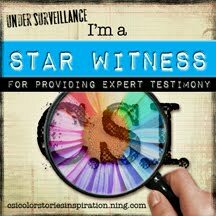 / STAR WITNESS!! WHAT AN HONOUR!! La forma en que Carolina abordó el relato sobre su signo astrológico es tán creativo. Nos encanta el modo en que, no sólo documentó todas las características de su signo sino también cómo remarcó, resaltó y comentó a mano alzada determinados aspectos! Qué manera tán creativa de contar su historia! Carolina's approach to journaling about her astrological sign is so creative. We love how she not only documented all the different traits of her star sign but then went through and highlighted, circled, and made little comments about certain things! Such a creative way to tell her story! This is just so much fun, Carolina! I just love how you’ve added the notes and circles and underlines—so creative and out-of-the-box thinking! So neat how you did the title letters too! Congrats Carolina on the Star Witness feature! Congrats on being the star witness Carolina!!! I hope you are feeling better now Carolina! Such a fun layout. Love all the happy doodling that you did. TFS! I love this idea- I like your purposeful carelessness of the page- sometimes that is when we let ourselves be free to be the honest us. Love all your doodles and scribbles and highlighting of important aspects of your sign. As a beginning dabbler in art journals, I love this. I wish I could create an art journal page like this. Wow, Carolina! What an awesome page, full of such thoughtful detail, and your excitement really comes through. I enjoyed reading your process! I love how the whole design flows together, great layout! HOLY MOLY!!! This is incredible and awesome and WOW. Love all the journaling and the handmade TH elements!!! The closeups just make it that much better! GREAT details! Awesome page, I was so frightened when my husband did it but he said it was a blast, so I do hope you get to it someday too! Lovely details and techniques! Great job, Carolina! La web está llena de desafíos como este, y en casi todos los idiomas… busquen uno que les guste y participen! Estoy segura de que no se van a arrepentir… pero les advierto… puede llegar a generar adicción!! The WEB is full of challenges like this, and in most languages… just find one that you like and participate! I am sure you won´t regret it, but let me warn youu… it might create addiction! And if you like so far what you saw of CSI, I must insist, please visit the CSI: Colors, Stories, Inspiration website and join in! Gracias CSI por las menciones! Thank you CSI for your recognitions! What a wonderful post, Carolina! Thank you for helping to spread the word about CSI, and thank you for your enthusiastic participation in CSI! I am glad you like it. And very happy to participate in your challenges!